SANTA FE – A new Share with Wildlife program license plate available to the public features a Rio Grande cutthroat trout, New Mexico’s state fish. Since 1981 the Share with Wildlife program has funded wildlife research, habitat enhancement, education and rehabilitation projects around the state. Many of these projects benefit nongame species in need of conservation. The program relies upon donations, including the purchase of special license plates from the state Motor Vehicle Division (MVD). Initial cost for the plate is $27, with $15 going to the Share with Wildlife Program. The program also receives $10 of the annual $12 plate renewal fee. 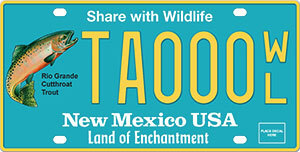 To order the new plate, please visit the department’s website at www.wildlife.state.nm.us/share to download the order form used to purchase the plate from MVD. The plate only can be purchased through regular mail. Additional donations can be made to the program by earmarking a portion of your state income tax refund. Just check off the box on your income tax form. Donors also can contribute through the department’s online licensing system at https://onlinesales.wildlife.state.nm.us/. All donations fund projects, not program administration. For more information about the program, contact Ginny Seamster at (505) 476-8111 or virginia.seamster@state.nm.us.